One of the most fundamental financial lessons your kids are going to have to learn is about how you work for your money. 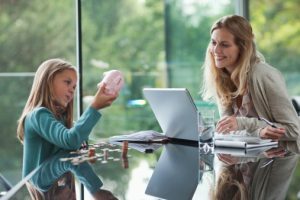 Do your kids understand that every time you pull out a wad of bills or swipe a card to pay for a purchase, that money is directly linked to time your put in at the office? Do they realize all of your money is earned through hard work? Here's how to make sure your kids - at any age level - understand this concept. This month's goal: Teach your children that money for purchases, whether it's paid through cash or a card, is earned through hard work. Money is earned through work. Every dollar spent is time you spend working. Any method to pay for purchases comes from the same source. What do you think mom/dad does all day at their job? We work to do what our bosses want and need. How do you think our bosses reward us? When we spend money for pizza, groceries, toys or movies, where do you think that money is coming from? This is mom/dad's paycheck from work. When we give it to Health Care Family Credit Union, we have money to spend. Why do you think we put the paycheck in our account? When I swipe my debit or credit card, how does that pay the store owner? Where is the money coming from? Why do you think people work? Do you think people who work harder for their money spend it more carefully? Would you still want that toy or electronic gadget if you had to work for it? If you had the choice to work 16-hour days for double the salary of an 8-hour day, would you take it? Why or why not?